Throughout a PT session there are many opportunities to influence the patient’s health; both for the immediate and long term effects. This post will go over the 4 factors of recovery that I often try to discuss with patients before they are discharged from Physical Therapy. Each of these 4 factors could be a book on its own, let alone a blog post. To save myself some of the mental stress of going over each of them in-depth, I’ll just briefly describe the factors and some methods for improvement. This goes not only for exercises, but the lifestyle changes as well. If you don’t sleep well, have never meditated, and eat bad food, then you shouldn’t try to influence other people. Sleep is a difficult one. Going to bed at a descent hour is extremly difficult these days. Youtube, reddit, twitter, league pass, and Netflix (how can you just watch 1 episode of House of Cards?). But it’s one of the easiest ways to improve recovery. Sleep gives us the lowest level of stress (internal & external) on the body. This low level of stress allows us to get out of the red and into the black. It lets us recover. Both mentally and physically. The science behind sleep (and why we need it) is still not conclusive. But we do know that sleep plays a huge role in hormone regulation (melatonin, GH, TSH, testosterone, cortisol, etc. ), augments immune system function, improves cardiovascular function, increases cognition, and improves neural function (stimulate oligodendricytes, myelin, neural development/repair). Plus, the supine position puts the lowest load on the body. So even if we don’t know all the reasons behind why we sleep, we at least know that it’s good for you. Most experts agree that you need at least 7 hours of sleep a night. Of course it varies from person to person, but if you’re getting less sleep than 7 you might have trouble recovering from the day’s cumulative stress (especially if you’ve put extra stress on it; i.e. workout, injury). Today’s culture creates quite a problem. We have these bodies that were developed from over 6 million years of evolution. This slow, progressive, evolution of our physical body has given us the genes we have today. Even though we’ve become a different species than our ancestors, we still share many of the same genes. Thus, we share a similar body type as our ancestors. On the other hand, our cultural evolution has skyrocketed in the last 10,000-50,000 years, leaving our physical bodies way behind. And this cultural evolution continues to progress at an exponential rate. The Agricultural and Industrial Revolution were the first big events that changed the way humans live. Now we have the Information/Telecommunications Revolution. We are spending more time plugged in and less time present with our bodies. From this cultural evolutionary perspective, we don’t share much in common with our ancestors. The difference in physical and cultural evolution has created quite a problem for our species. This creates a mismatch between the environment we live in and our physical bodies. In other words, our bodies are not made to live in today’s cultural environment. The result of this, and the fact that we often treat the symptoms instead of the cause, is what Daniel Liberman refers to as dysevolution. A product of this dysevolution is the increasing amount of mental stress/disorder and physical dysfunction. Luckily for us, there is a method to help prevent or decrease this mental burden – Meditation. Meditation has been around for possibly 5,000 years. Needless to say, it has some empirical evidence. I have taken UCLA’s on-line meditation course with mindfulness expert, Diana Winston. While this by no means makes me an authority on the subject, it has educated me on some of the science behind meditation and how to apply it. The benefits of meditation are incredible and the profound effects cannot be overstated. Many people talk about the life changing effects of this practice. Even some of the most successful people in our society have credited meditation as a big part of their growth and accomplishments. But even if empirical evidence doesn’t convince you, modern research has shown many positive effects. And did I mention that it’s free and easy? Well…it’s free and physically easy. Developing your meditation practice is a process and requires some motivation and mental effort. But don’t take that as a deterrent, it’s not exhausting or mentally fatiguing. In fact, most people feel energized after meditating. The most difficult part is getting started and developing the habit of meditating. I think one of the best places to start is with Diana Winston’s 5 minute breathing meditation (YouTube). 3) The diaphragm is the only voluntary muscle that can directly influence the autonomic nervous system. Breathing augments the parasympathetic response of meditation. It’s important to note that I don’t immediately jump directly from discussing a painful shoulder to giving them a 5 minute meditation recommendation. Before I prescribe meditation to a patient, I first educate them on the autonomic nervous system continuum (sympathetic vs. parasympathetic). 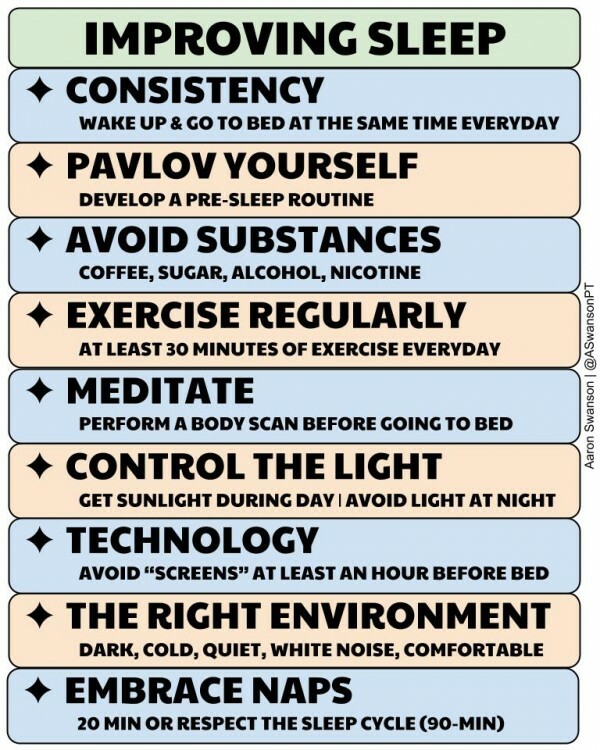 Then I begin to explain some of the benefits of meditation and how it can aide in their recovery. If they are receptive, I simply write down my meditation recommendation (above), tell them to type it in on google, find a quiet place, and try the 5 minute meditation. One benefit of our accelerated cultural evolution is that there are now plenty of meditation guides, timers, apps, and techno-bio-feedback devices that give people an easy way to stay on top of their meditation practice. Bringing up diet is a lot like bringing up politics. Everyone has an opinion and no one knows what’s really going on. Do we eat nothing but bacon? Is carbohydrate a bad word? Is there a chocolate diet? However, more science and less propaganda has allowed for a recent paradigm shift in diet. We’re only scratching the surface and the answers will vary per person and per culture. But it has gotten a lot better than that terrible food pyramid we were taught to believe. Trends will come and go, but I feel that there are 5 facts that would help most people. Of course there are a lot more to these “facts” than a simple sentence, but hopefully it’ll give some direction for nutrition choices. I don’t think these 5 Facts will change as they seem to be backed up by basic physiology, logic, and evolutionary medicine. We may learn more about the specifics of each category, but the basic principle shouldn’t change. For example, it is now well known that fats are good for your health, but research is finding out which specific types of fats are healthy and which are detrimental (i.e. trans fats). The benefits of exercise are enormous. Exercise improves the musculoskeletal system, controls weight, increases life span, reduces diabetes risk, improves mental health, reduces risk of some cancers, improves cardiovascular fitness, and improves sleep. • For the long term ability to adapt to stress. The immediate beneficial effects of exercise for recovery should be focused on the circulatory system. The goal is simply to get blood and fluids moving around. This should include some active dynamic stretching, mobility work, light stabilization, and/or light aerobic exercise. The long term effects of exercise are much more complicated. This requires specific individualized programming that involves periodization and deloading. People should have a normal overall fitness and exercise routine to help stress the body for an individualized adaptation. Because in the long run, the body can only handle what the body is adapted for. There are many great articles regarding the physical aspect of recovery. Check the references provided below for more detailed information. It’s often not the over-training, as much as it is the under-recovery. You can have the greatest training program and the best workout session from the best coach in the world. But unless you are able to recover from it, it won’t matter. I would even go one step further and say that lifestyle is the make or break of anyone’s health. Now I’m not saying you should go out and give your patients a full nutritional prescription or start discussing their childhood to determine why their boss stresses them out. Instead, you should just be assessing the factors that influence their recovery and offering some general advice (if you are educated). Anything more than this would be beyond health promotion and fall out of the scope of your practice. If someone is interested in a more in depth answer, you should refer out. The patient will benefit from a greater health “team” and the person you refer out to may even start referring in to you. Chen, Jui-Lien, Ding-Peng Yeh, Jo-Ping Lee, et al. “Parasympathetic Nervous Activity Mirrors Recovery Status in Weightlifting Performance After Training.” Journal of Strength and Conditioning Research25.6 (2011): 1546-552. Reimund, E. “The Free Radical Flux Theory of Sleep.” Medical Hypotheses 43.4 (1994): 231-33. UCLA – Mindful Awareness Practices (MAPs) I for Daily Living (On-Line). 2013. Blair, S. Physical inactivity: the biggest public health problem of the 21st century. BJSM.